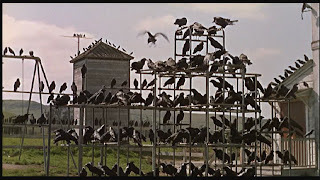 We were playing in Abby's room this morning when I looked outside and saw a scene straight out of Alfred Hitchcock's The Bird's. There were probably at least 50 birds in the front yard. Naturally, my cat was going nuts. Abby thought it was funny, the way Bart was acting. I told her that sometimes cat's chase and eat birds, and that's why Bart was excited. Abby looked at me and said, "Bart don't eat the birds. They're not good for you. You eat kitty food. I don't eat kitty food; I eat Abby food."